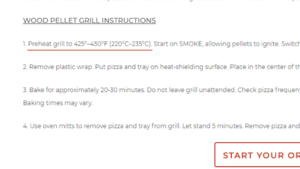 Here are the cooking instructions to grill a Chicken Special pre-prepared pizza from Papa Murphys. 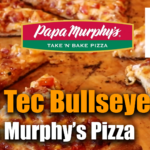 WARNING: If you are using a Bullseye do NOT follow the directions on the Papa Murphy's website on how to cook a Papa Murphy's pizza on a pellet grill. Here are the instructions on how to cook a Chicken Special pre-prepared pizza from Papa Murphys on a Pellet Grill If you are using a Bullseye do NOT follow their directions. 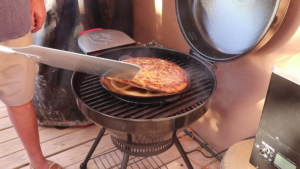 I will take you step by step and also give you recommendations on the correct way to cook a pizza on a Bullseye Grill. 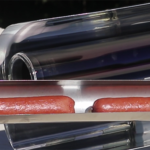 Put pizza and tray on a heat shielding surface. I strongly recommend using a pizza stone. 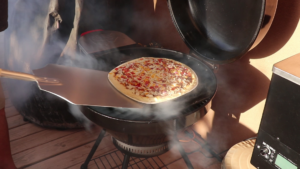 One is listed in the Cooking Tools section but any good pizza stone will work. Now item 3 is where the instructions fall off the rail. The Bullseye is a lot hotter due to all the radiant heat that is generated. The pizza is going to be done in less than 10 minutes. 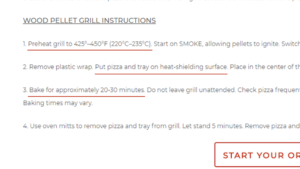 If you went 20 to 30 minutes like the instructions say the pizza will come out looking like a blacken frisbee and would most likely taste like one too. Item 4 is just dangerous. Use oven mitts to remove pizza and tray. Only if you want to have pizza with some paramedics that are hauling you off to the burn ward. For $17 you can get a Pizza Peel and have complete control of the pizza during the cooking process. 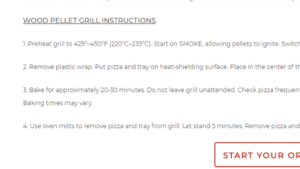 So here is the CORRECT way to cook a pizza on the Bullseye Grill. 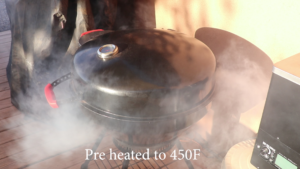 Preheat Bullseye Grill to 450F using a Pizza Stone. 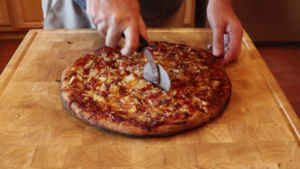 Using a Pizza Peel (oversized spatula) to slide the pizza onto the Pizza Stone. After 5 minutes start checking for doneness. When the pizza starts to darken on the bottom be prepared to remove the pizza. The Pizza Peel is real handy when trying to see if the pizza is done. 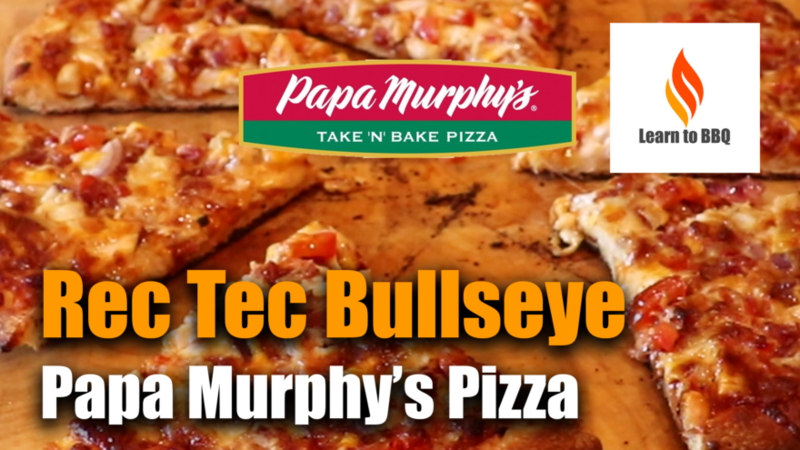 Remove pizza from Bullseye Grill using the Pizza Peel. 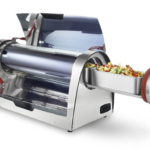 I will never ever cook another pizza unless I have a Pizza Peel. 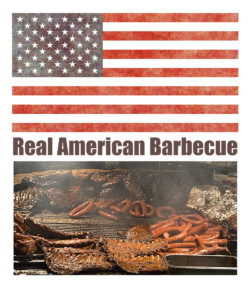 Check it out in the Cooking Tools section. 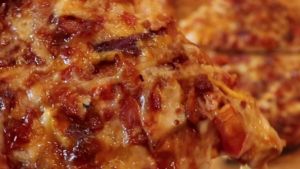 Let the pizza sit for a couple of minutes and then slice into serving pieces. I like the crust on the pizza to be crunchy. 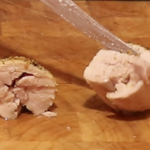 When you go to bite into it you can actually hear the crunch. If you want a softer crust then be prepared to remove the pizza at around 8 minutes or sooner.